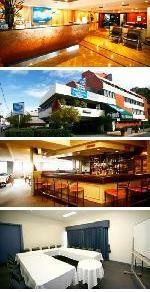 The City Park Hotel Melbourne offers accommodation in South Melbourne, only moments from the Melbourne CBD. Ideally located for the corporate traveller or leisure guest, the City Park Hotel, Melbourne is literally minutes away from the Melbourne CBD, shopping restaurants and nightlife as well as Melbourne attractions including the Crown Casino complex, Botanical Gardens, the Arts Centre, the F1 Grand Prix Track, Federation Square, Rialto Towers Observation Deck, Queen Victoria Market, Southbank, Bourke Street Mall, Melbourne Central, Olympic Park, the Melbourne Cricket Ground, the Melbourne Park Tennis Centre and Hisense Arena. Corporate business travellers are well catered for wireless internet access in all guest accommodation rooms, a dedicated business centre with photocopying service, facsimile facilities, translation services, conference/meeting facilities. The Best Western City Park offers superior customer service, affordable rates and a fantastic location in Melbourne, ideal for business or leisure travellers alike. The Queen Hotel Room is a spacious, comfortable and non smoking room. Ideal for a single, couple or corporate traveller, this beautifully appointed room offers an open plan design complete with air conditioning and heating, 1 comfoprtable Queen Bed, a modern private ensuite bathroom with shower, toilet, hairdryer and complimentary bathroom amenities, colour TV, FREE Foxtel TV, inhouse movies, high-speed wireless internet connection, dataport, modem line, direct dial telephone, writing desk with lamp and chair, alarm clock, ironing equipment, fridge and tea/coffee making facilities. The Queen Spa rooms are spacious, comfortable and non smoking Melbourne hotel rooms. Ideal for a single, couple or corporate traveller looking for that extra touch of luxury, this beautifully appointed room offers an open plan design complete with air conditioning and heating, 1 comfoprtable Queen Bed, a modern private ensuite bathroom with SPA BATH,shower, toilet, hairdryer and complimentary bathroom amenities, colour TV, FREE Foxtel TV, inhouse movies, high-speed wireless internet connection, dataport, modem line, direct dial telephone, writing desk with lamp and chair, alarm clock, ironing equipment, fridge and tea/coffee making facilities.